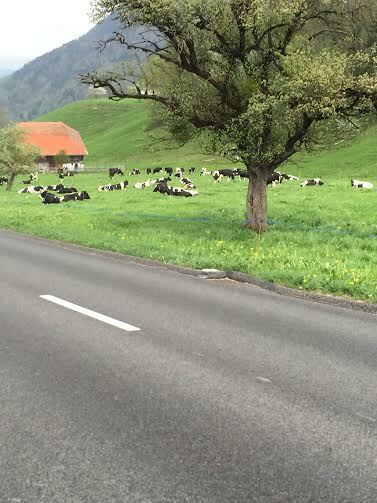 This week, I learned what Switzerland is really all about: cheese, chocolate, and cows. 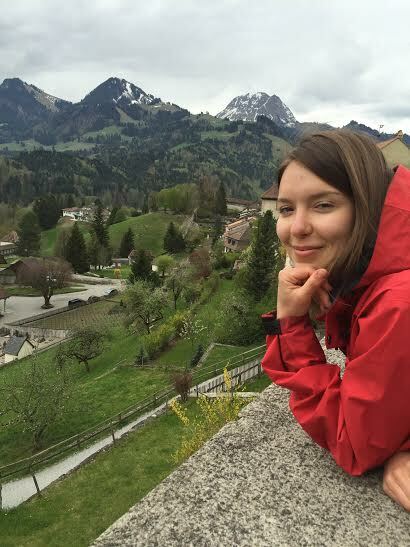 I got the amazing opportunity to go to Gruyères, which is the town that actually makes Gruyère cheese, the staple of Swiss cuisine. Of course because this is Switzerland, the town itself was charming and adorably and obviously had an amazing view of mountains and nature (the number one criteria for Swiss cities). 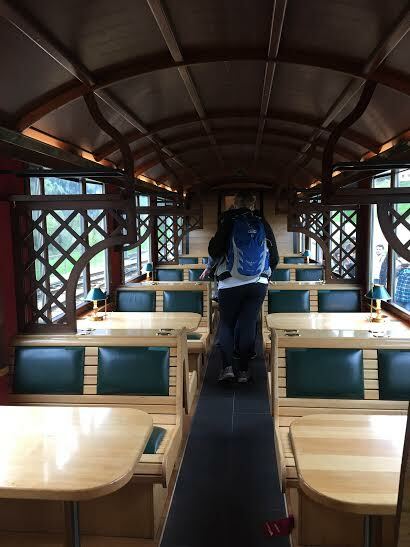 This was the train that took us from Lausanne to Gruyères. I have never in my life experienced something so adorable that it almost didn’t seem real. This picture explains how the views in Switzerland are still amazing no matter how many times you have seen a snow covered mountain. While in Gruyères, I got to sample all of the different types of Gruyère and I could not believe how one kind of cheese could have so many different tastes. We learned how the cheese is made, and how these different types of Gruyère result from the aging process. I also got to try the cheese just before it was put into the rounds, at the very beginning of the process. It was DISGUSTING. 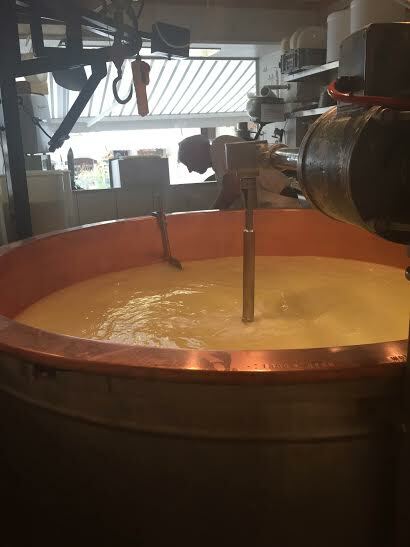 This is the very first stage of cheese making, where the milk gets churned until it makes this gummy type-substance that will be aged to make cheese. This is the gummy stuff that I tried. Very appealing, I know. It was gummy and white and totally flavorless and I cannot imagine how the beauty of Gruyère cheese is made from such an unappealing thing. That being said, I thoroughly enjoyed all of the samples throughout the day. The Swiss cheese makers clearly know what they are doing. 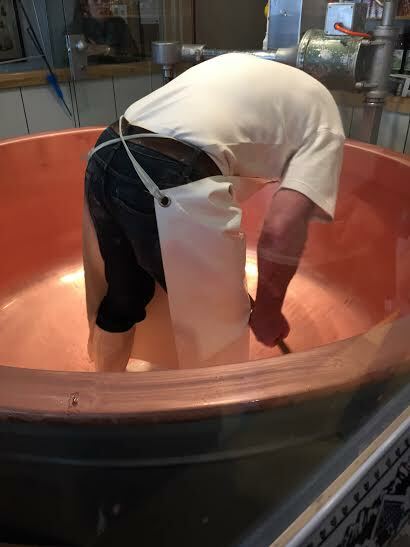 This man told us all about how he crafts his cheeses, and then proceeded to jump into the giant vat where he made the cheese. After trying loads of cheese, we walked it off on our way to eat even more chocolate at the Cailler chocolate factory! 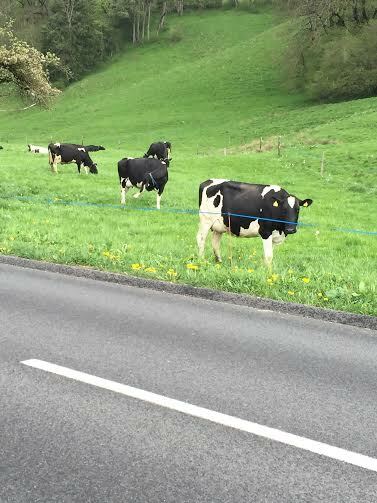 On our path, we came across more cows than I have ever seen in my entire life. I finally felt like I was in a traditional, small Swiss village. I have made it fairly clear that I am not a super outdoorsy type of girl, so while some other students got a closer look at the cows, I chose to use the ‘zoom’ setting on my camera. Okay, so they are kind of cute, but they are still livestock and therefore I kept a fair distance. First, we got to walk through a ‘history of chocolate’ interactive museum that showed us how chocolate has evolved over the past few centuries and where chocolate originated. 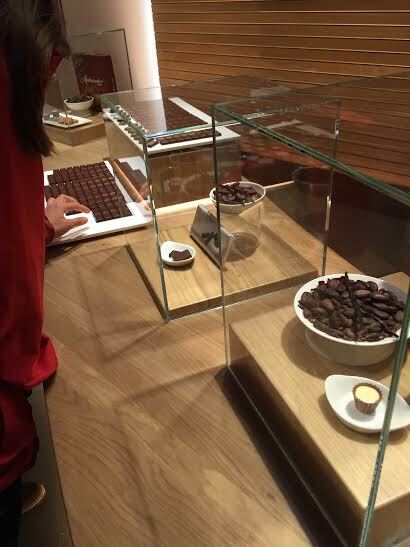 Then, we got to see how Cailler, Switzerland’s major chocolate producer, came to dominate the chocolate world. While this was all well and good, the best part did not come until the very end. 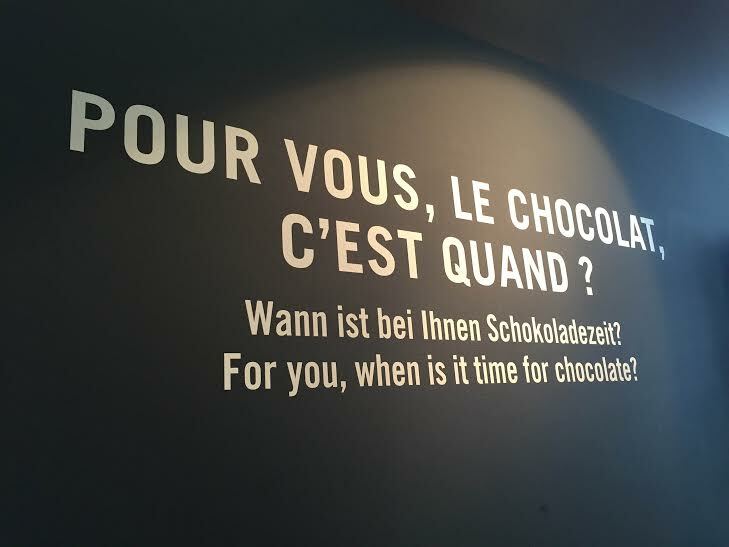 Il était une fois: Evidently, the Swiss take their chocolate very seriously. After the tour, we got to try some of the raw products that go into the chocolate, like almonds, hazelnuts, and raw cacao. I obviously ate as much as I possibly could, which backfired in the end. After this stage of the tasting, we actually got to taste some of the final product Cailler chocolate. Le chocolat, c’est quand? 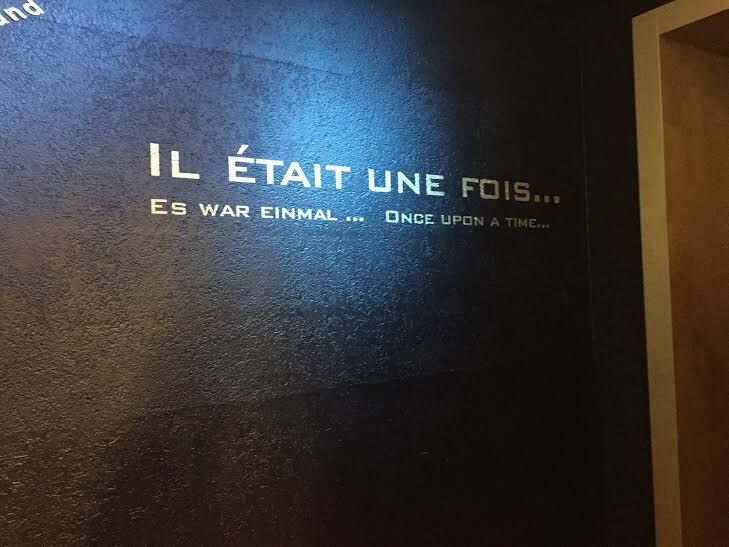 C’est toujours Cailler, always. We saw how a certain type of their chocolate is produced and then a factory worker handed us some samples. I expected one or two, but thanks to a very generous worker, we all got a TON of these samples. I was regretting eating all of the raw cacao in the beginning. After this stage, we got an unlimited tasting of all of the Cailler specialties. Yes, you read that correctly, unlimited free samples! 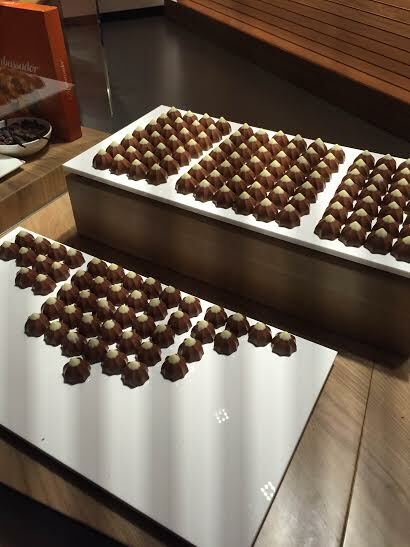 These chocolates had caramel, hazelnuts, creamy nougat centers, and coffee infusions. Again, I ate as much as I possibly could but there is only so much chocolate a girl can take. Here in Switzerland, people often eat chocolate as a part of their daily diet. For example, if you are about to go workout and need some pre-exercise fuel, the Swiss would suggest eating a small bar of chocolate. I would like to note that I approve of this mindset. Although I could barely move after so much chocolate, the experience was amazing and despite my declarations that I would “never eat chocolate again”, it took me all of one day to return to my pro-chocolate mindset. It was easy to forget in such a cool place that I am an actual student with actual responsibilities, but now I am getting into the swing of final assignments. I do not have any final exams after the class period, but I have a lot of papers and in-class exams to finish in the next couple of weeks. But with the help of the best chocolate in the world, I think I will be able to make it through, wish me luck! This entry was posted on Tuesday, May 5th, 2015 at 10:34 am and is filed under Jackie in Switzerland, Spring 2015. You can follow any responses to this entry through the RSS 2.0 feed. Both comments and pings are currently closed.